Do you have an old car? Is your valuable space being wasted? Are you sitting back, thinking to yourself, I need to junk my car? Well, good news! Junking your car is a simple process and can bring you instant cash in your pocket. Like they say, one mans trash is another one’s treasure. Is your car older, or needs many repairs? This is the perfect situation to be in to junk your car for cash! Scrap metal is worth a lot to junk yards because up to 95% of cars can be recycled into scrap metal and can be sold for use again. Meaning, your old piece of metal brings a good price to our salvage yards. There is also a great chance you will be getting more money for your junk car by selling it for cash to a salvage yard, rather than selling it to a dealer. If your car needs new tires or has engine problems, dealers are not going to turn around your car for a small amount of money. Dealerships looked at these cars as “junk”, therefore, you will not be getting much money for your car, if any. Many people do not think they can get much cash for their junk car, but the truth is the payout can be quite large, which means more money in your pocket! As far as pricing goes for your own junk vehicle, it will vary by different salvage yards. The amount of cash for cars are mainly based on the year, make, and model. The more information you give a salvage yard, such as mileage and if there is any damage to the vehicle, can help them come up the highest and most accurate price possible for you. Mainly, the price for your vehicle depends greatly on its condition. For example, if your car is complete junk and not operating, it then will depend on it’s size and weight, in which the metal can be reused. As a consumer, do your research, get quotes for your junk car at different locations and weigh out your options. 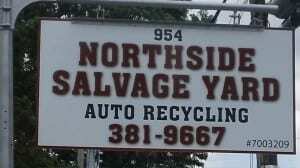 As the largest auto crusher in Rochester, NY, Northside Salvage Yard offers you the highest rates in town for your unwanted vehicle. Get cash for your junk car with same day, free pick-up, and same day cash. It really is that simple! Simply visit call (585) 444-8866 or visit our website at www.iwantscrap.com to answer a few questions about your vehicle and we will send a free quote!